It’s hard to believe that anyone would try to justify experiments that involve kidnapping baby monkeys from their mothers and repeatedly terrorizing them, but the American Psychological Association (APA) and the American Society of Primatologists (ASP) recently did just that. 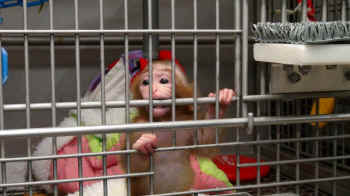 After members of Congress requested a bioethics review of experimenter Stephen Suomi’s hideously cruel maternal-deprivation experiments on monkeys at the National Institutes of Health (NIH), the APA and the ASP wrote to Congress to attempt to defend and excuse the experiments. Given the availability and effectiveness of human-based research methodologies, the harm caused to animals, and the inherent limitations of using nonhuman species to model complex human neuropsychiatric disease, the use of animals in NIH’s maternal deprivation experiments is not justifiable. Dr. Suomi’s and his colleagues’ use of maternal deprivation in monkeys, a practice known to cause significant and permanent emotional and physical harm … [has] attracted ethical and scientific criticism from a wide range of people including primatologists and other animal-behavior experts, mental health professionals, animal activists, and laypeople who repeatedly point out that these monkeys have complex social needs, are intelligent, and have a capacity for suffering, including the extreme suffering experience[d] by infants because of maternal deprivation. This isn’t the first time that the APA has supported egregious and indefensible practices. The organization vigorously defended the abuses uncovered by PETA in our landmark Silver Spring monkeys case; fought tooth and nail against including mice, rats, and birds in the Animal Welfare Act; opposed a bill to ban the sale of stolen dogs and cats to laboratories; and rallied against the proposed ban on the use of chimpanzees in experimentation. Animals in laboratories need our voice. Please, tell NIH to stop tormenting infant monkeys in cruel and useless experiments. And if you’re a U.S. resident, please also urge your members of Congress to take action to end the funding of costly, irrelevant, and inhumane psychological experiments on baby monkeys at NIH. ADD YOUR NAME! Tell the University of Wisconsin: Cancel The Unethical Torture and Killing of Baby Monkeys!